If I thought the first leg was poor, then this match in Denmark was ten times worse. 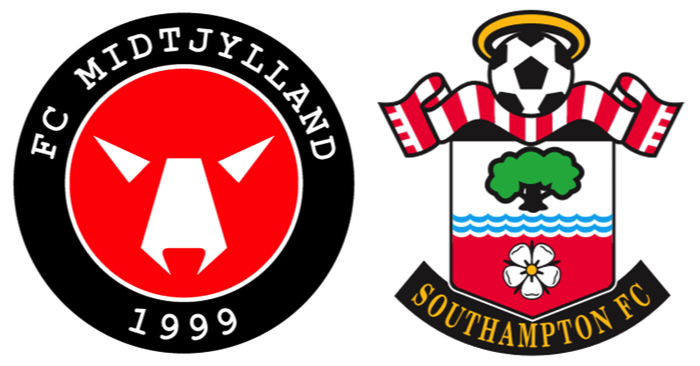 The problem in the home tie was that Saints just could not find a way to cope with Midtjylland's negative tactics and time wasting. On the balance of play then, Saints probably shaded it, but still conceded an away goal to the Danes. This time Saints couldn't claim that. Apart from a brief moment at the start of the match, when Fonte had a header cleared off the line, the team were second best. The only tactic seemed to be for Caulker to lump it up the field to Pellè. Again and again and again. This only seemed to change in the second half, when Tadić replaced Caulker, Long replaced Rodriguez and finally Juanmi had replaced Davis. This was all too little, too late. Particularly as Midtjylland had scored a goal before the match was half an hour old. So that was Europe that was. When the line up was announced it struck me that it was overly defensive, with all three central defenders again and Martina starting as a full back. Mané was on the bench, but not fit enough to play for long. Talking of which, Shane Long was on the bench as well. Wanyama was missing altogether, a stomach upset, or something similar. Apparently. What with Dušan Tadić's blood disorder, Koeman was struggling to put together a cohesive team. If you look at the team on the second tab here, the only attack minded players on the pitch were Pellè and Rodriguez. JRod is not anywhere near up to speed yet and poor old Graziano seems doomed to toil at the coalface for every minute of every match, with little respite and even less help. From the off, Saints almost immediately made a breakthrough, when José Fonte had a header cleared off the line by a Midtjylland defender. Looking back now, I do wonder what would have happened if that had gone in, but that's football. Again. In the immediate aftermath of that chance Saints had a couple of other decent chances which came to nothing, but Midtjylland gradually realised that Saints only seemed to have one tactic and that played right into their hands. The Midtjylland goal when it came just short of the half hour, was from a mistake by Rodriguez and their No.9, Rasmussen made light work of scoring. At this point I am sure that Saints fans everywhere had their collective heads in their hands. 2-1 down on aggregate and playing without any sort of fluency, or threat. As the remaining confidence ebbed away, the second half saw little improvement in ambition. And so, Saints european adventure drew to a close. As cross as I was at the manner of the defeat to a team that, at best were limited in skill, i am not totally despondent. Firstly it is still August and the season doesn't end for another nine months. The engine room of the team was missing. Clasie, Creative Director and Wanyama, Enforcer (will he still be a Saint after the window closes next week? ), together with our first choice left back, Bertrand. Added to which we have still not managed to get a suitable replacement central defender for the departed Alderweireld. The team just looks unbalanced. Even the normally reliable Fonte is looking shaky. It is nowhere near panic time and I am sure that the team will gel. Saints fans really need to get behind the team on Sunday. A win would put smiles on faces again.